"A Berry Happy Birthday" to BDEIG! Strawberries, gooseberries, huckleberries, blueberries, currants, and blackberries! 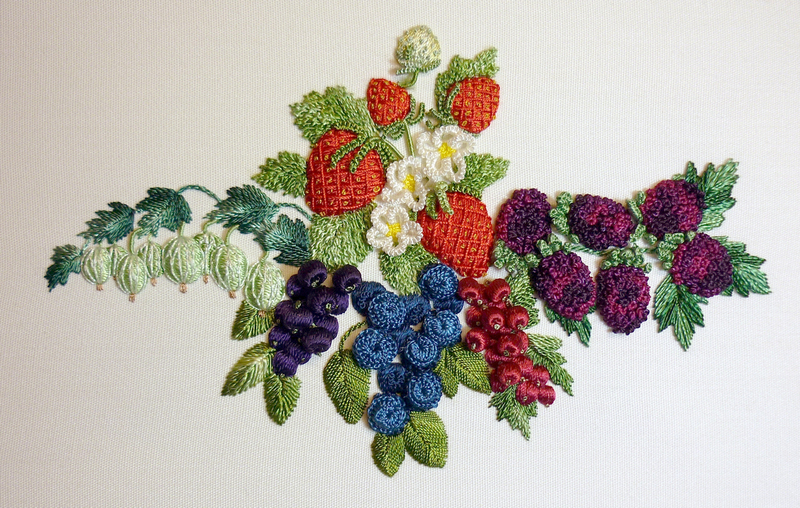 This Berry Bouquet class consists of learning four techniques for padding satin stitch, working on improving your satin stitch skills, learning five different ways of decorating the padded satin stitch to achieve the textures of the berries, which include my interwoven cast-on; wrapping beads with thread and attaching them to your work so that they hang from a “stem”; and a self-padding leaf. Stitches taught will be how to achieve flawless satin stitch, Rhodes stitch, interwoven cast-on, “Berry Bead Drizzle”, plus the above mentioned padded satin and decorating techniques. It is helpful for students to be familiar with stem stitch, cast-on, up/down cast-on, double cast-on, drizzle technique, French knots, satin stitch, colonial knot, and couching. Abalone shell - who can resist those gorgeous colors? 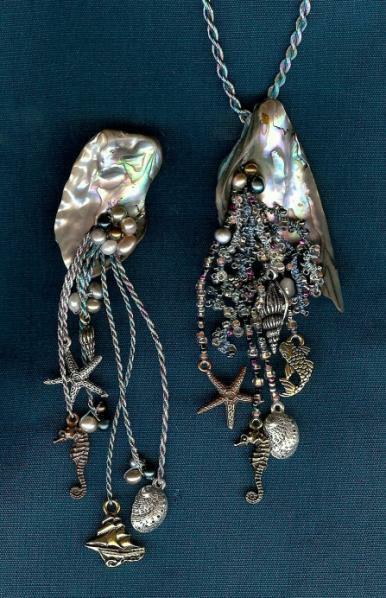 Stitches Included: Beaded drizzles: Design Area: Size varies, pieces shown are pendant 4.5" and brooch 4.75" overall. Floss Needed: For charm cords and drizzles: Glory, 041, 071, 311, 170. 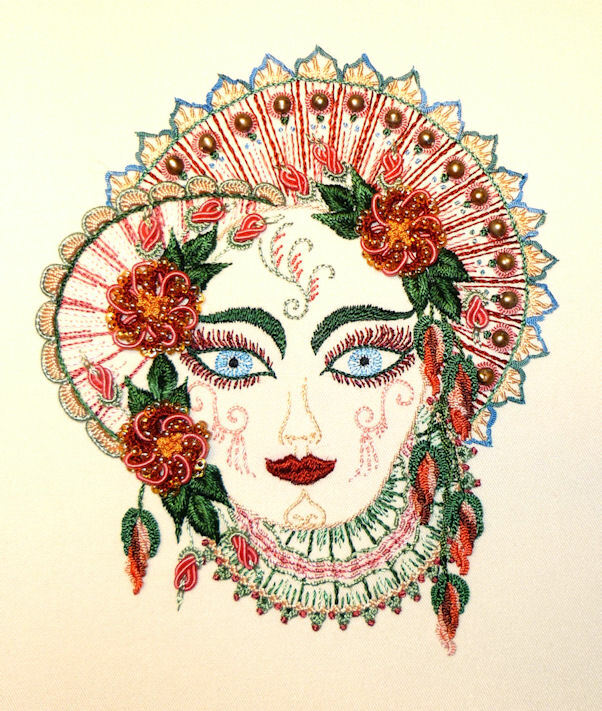 She is "Pretty" as a peacock in her Venetian-style mask, complete with a bouquet of peacock feathers/flowers. We will learn the intensive technique used to create these life- like feathers, peacock eye flowers, plus the jewels and textures adorning her mask. It will be helpful for students to know the cast-on, up- down cast-on, satin stitch, and blanket stitch. Stitches Included: Stitches/techniques taught in class will be my braided fly stitch, auto-Palestrina knot, stem stitch, how to create the expressive eyes and those luscious lashes. Also – let’s play with color! The feathers are made using four different colors of Glory to create the colorplay/iridescence found in real peacock feathers. Students may want to bring a good supply of Glory colors for experimenting in class. For example, if you don’t like the “orange” color in the feathers, substitute a dazzling pink (204), intense blue (201), or bright green (148). Using a different combination of colors for the mask make it similar yet just different enough from the feathers so that it pops! You can make this design become the colors YOU want it to be! A doodle cloth will be provided for each student. Special Requirements: Paintstiks in the following suggested colors: Iridescent colors--charcoal, purple, brown, white, leaf green, light gold, iridewscent blender, Standard colors--asphaltum, olive, sap green, barn red, yellow ochre, meadow green. Paint brushes preferably the flat bristle kind for blending paints, turpenoid or paint brush cleaner. Timtex or Peltex (1/4 yd), Iron on Fabric interfacing, medium or light weight (1/3 yd). Parchment paper, an iron and ironing surface. Warm and Natural quilt batting (1/4 yd). #15 Milliner's needle, #16 darner, three #1 extra long darner needles, drizzle pad or pin cushion, needle gripper, several textured items for creating interesting patterns on the fabric with the Paintstiks. Several small flat rocks, a white fabric marking pencil, a piece of chip board for making the rock template. Tulle in a color that closely matches the rocks (1/8 yd). DMC Perle Cotton, Size 5, Color #988 or similar "green fern" color, DO NOT CUT THE SKEIN. Two pieces of acid free foam core (8" x 11", and 5" x 7"). Stretcher bars, 10" and 12", several sticky back Velcro dot fasteners. This is an advanced Brazilian Embroidery design. 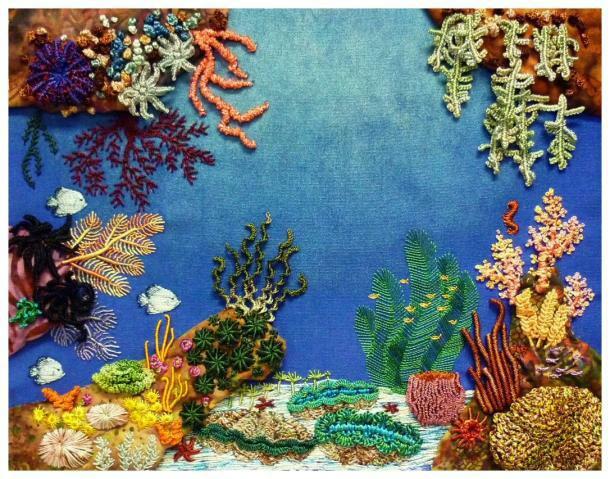 The colorful bounty and stunning beauty of a coral reef--captured in Brazilian embroidery! This piece is dimensional to say the least. Some of the stitching I son the background blue fabric, the reef pieces (corners) are batik fabrics (included in the kit) that have been enhanced with Brazilian embroidery and then attached to the blue background piece. The filtered sunlight effect is achieved with paint sticks. Stitches Included: Tapered single and double cast-ons, Boucle bullions, branching double cast-on drizzles, branching bullions, up down knotted double cast on, long Nova bullions, spider web weaving, automatic Palestrina, and Rhodes stitch. It will be helpful to be familiar with the following stitches: cast on, double cast on, fly stitch, up down cast on, knotted cast on, lzay daisy, bullion straight stitch, satin stitch, French knot, dirzzles. Design Area: 10" X 8" Fabric Size: 18" X 15". Cire: 53 (shaded light/medium yellow green), 65 (red). This is a single rose made using 4, 3-inch needles placed in a drizzle pad. If you haven’t used this wonderful technique you will be amazed what up/down cast-ons over multiple needles making a drizzle can turn out to be. Students who know the drizzle technique and can carefully count will be able to do this design. If you are very careful when pulling threads to anchor your cast-ons, you’ll end up with a beautiful petal and get to do 4 more to make a beautiful rose. 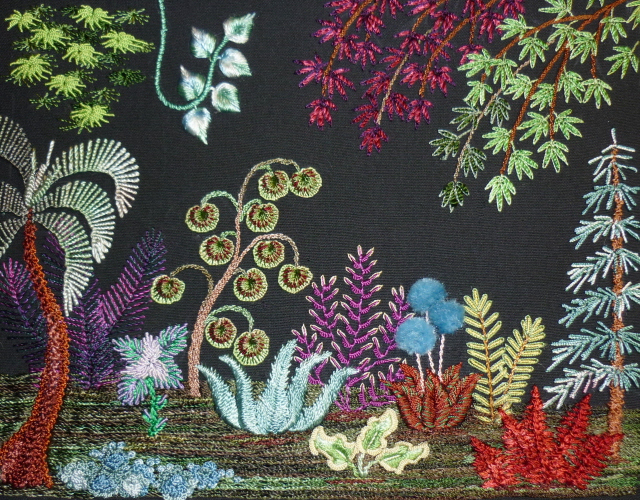 Fabric Size: 12" x 12"
Plant foliage can have fabulous texture and color, just like flowers! 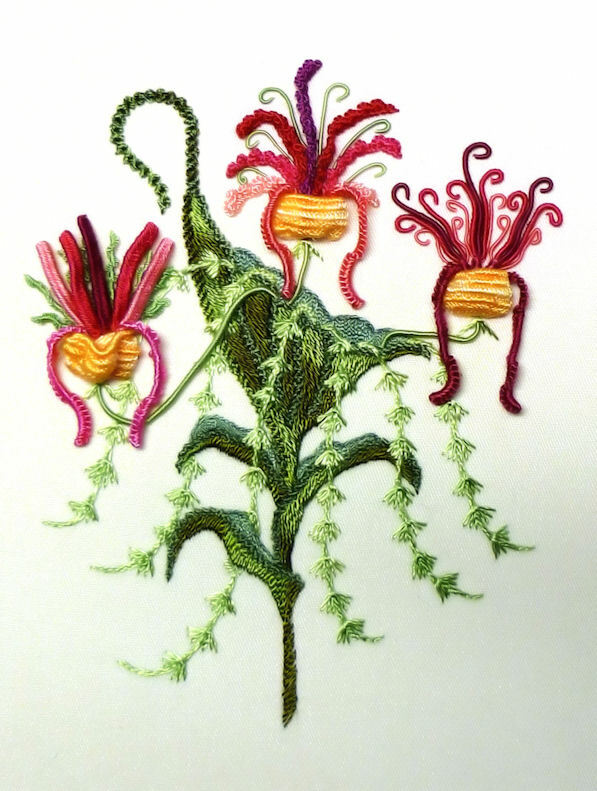 This is a fun and unusual class, and a garden that features techniques and colors inspired by real leaves, placed upon plants and stitched in my imaginary garden. 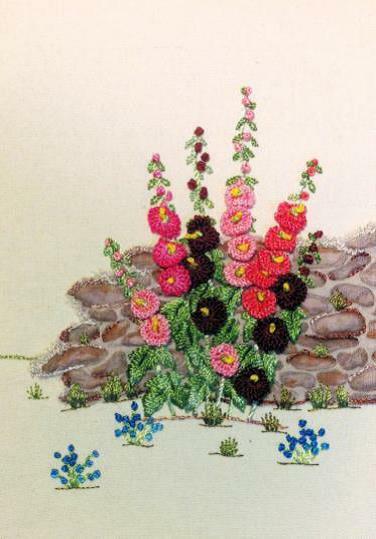 We will use a variety of familiar stitches combined in unusual ways to create the foliage. (Please note: There are only a couple of stitches that require this to be “Advanced”, otherwise it would be considered Intermediate.) Stitches used are: bullion, straight stitch, satin stitch, outline, lazy daisy, bullion lazy daisy, stem stitch, double stem, fly, turkey, van dyke, blanket, cast-on, wrapped stem, rick rack (thank you, Rosalie Wakefield), and my auto-Palestrina, combination “comma” (thank you, Rosalie Wakefield) feather stitch, and cast-on cast-on stitch. A cream colored doodle cloth will be available for each student. Design will be available on black, cream, or white Trigger. I love birthday cake! Are you one of those people who wants the corner piece with all the frosting flowers? Me too! Here’s your chance to have those gorgeous flowers all the time, slathered onto (butter frosting) cream Trigger or (whipped cream frosting) white Trigger. 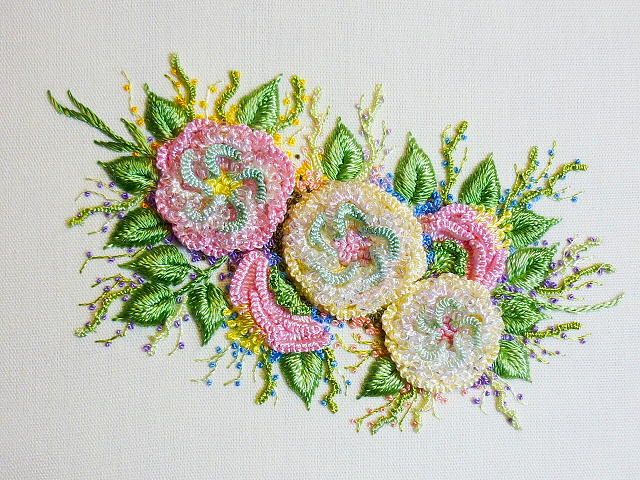 The flowers are four layers of gorgeous sweet stitches. Stitches taught are my cast-on blanket stitch, beaded cast-on, and the up/down cast-on, cast-on drizzle. The beauty of this flower is in the placement of the stitches and layers. It is helpful for students to be familiar with cast-ons, French knot, and satin stitch leaf. A doodle cloth will be provided for each student. A gloriosa lily and a voodoo lily or are they? Two ladies having tea, or are they flowers? How about both! Glory’s beautiful dress is stitched with stacked split stitch, stacked stem stitch, detached auto Palestrina knots, and cast-on lace. 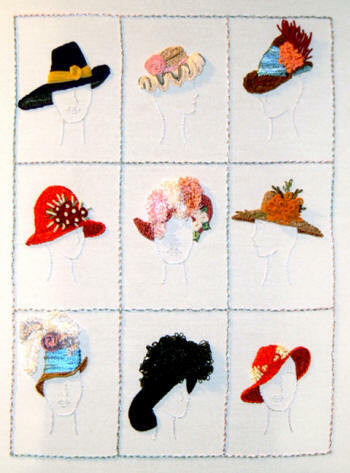 Her hat is woven and adorned with French knot flowers. Voo’s beautiful dress is stitched with some of the same stitches and also the wavy cast-on. This is an advanced level Brazilian Embroidery design. Stitches used: satin, bullion, cast-on, blanket, French knot, stem, drizzle, lazy daisy, Turkey, and back stitch. This is available on white fabric. Lola 029, 132, 153, 159, 209, 211, 223, 303, 314, 315. Special needs: Rainbow Gallery brand Petite Very Velvet V626, V657, V665, V601, V639; Mill Hill Petite Seed Beads 40123, beading thread and needle. 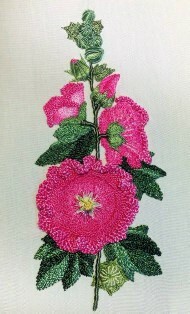 This is an advanced/intermediate Brazilian Embroidery design. Stitches used: blanket, cast-on, lazy daisy, couching, drizzle, buillion, and stem. This is available on white or cream. Special Needs: Drizzle pad and 3" #1 or #3 long darner. Life-size rendition of our Flower of the Year, the Hollyhock. It illustrates the life of the hollyhock from newly formed bud to full blossom to seed pod. Stitches Included: Padded satin stitch, stacked split stitch, raised blanket stitch, wrapped stacked stem stitch, detached automatic Palestrina knot, knotted quadruple cast-on. Students should be familiar with, stem stitch, cast-on, bullion, French knot, drizzle, blanket stitch. 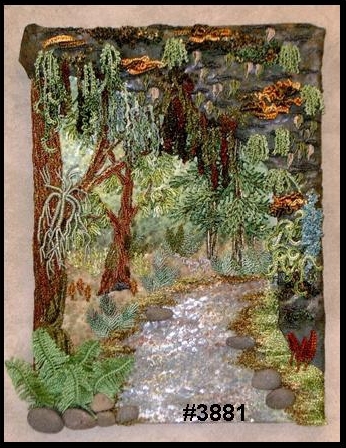 Fabric Size: 12" x 18"
The pre-printed rock fabric is appliquéd to the background fabric; stitching is added here and there to accentuate the rocks. Standing in front of the wall is a beautiful spray of colorful hollyhocks. Stitches Included: Stem and outline stitch, cast-on, couching, French knot, drizzle, lazy daisy stitch, and detached Automatic Palestrina Knots. A charming array of flowers, the tendrils of these flowers just happen to be growing in the shape of a teapot! 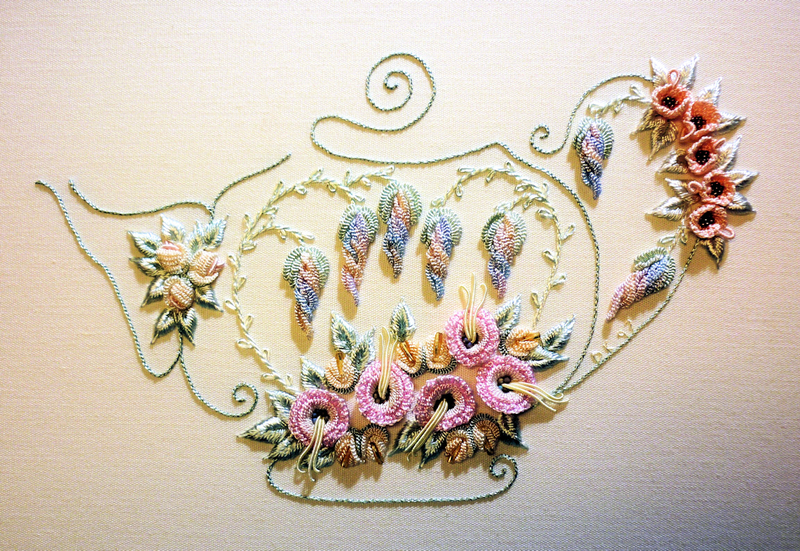 The tea-themed flowers are; sugar drops, crumpets, teacups, saucers, ruffly buds. The first design in the "Mask Series", Fancy lives up to her name! Each fan that surrounds her lovely face is edged with a different faux-lace technique using Brazilian embroidery stitches. One fan is decorated with pearls, the other is decorated with a woven running stitch ribbon, and the third features cast-on/bullion combination lace. The flowers that adorn her mask are my Sugar Drop, Twisted Bud, and Beaded Cast-on Flower. It will be helpful for students to be familiar with beginning B.E. stitches plus the up-down cast-on. Stitches Included: Stitches taught will be the beaded cast-on, the three lace techniques, complete instructions for the three flowers, woven running stitch, my automatic Palestrina knot, l-o-n-g Ciré bullions, and how to create expressive eyes and those luscious lashes. A doodle cloth will be provided for each student. Design Area: 5.5" x 6"
New orchid species are being discovered almost every month. This new orchid, "Showgirl", has three different species, Cirque, Flamingo, and Bellagio. This design is a fun review of several of my original stitches, the automatic Palestrina knot, DV’s Crazy 8’s (created with Virginia Chapman’s assistance), cast-on cast-on, and bullion/ buttonhole weaving technique. Stitches Included: All of the above stitches will be taught in addition to my new double cast-on into five bullion stitch and split stem stitch! It will be helpful for the student to be familiar with the bullion, cast-on, drizzle, up-down cast-on, satin stitch, double cast-on, blanket stitch, stem stitch, fly stitch. A doodle cloth will be provided for each student. 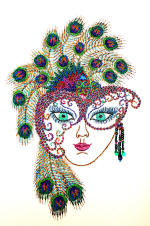 Design Size 5" x 6"
This is an intermediate/advanced Brazilian embroidery design. 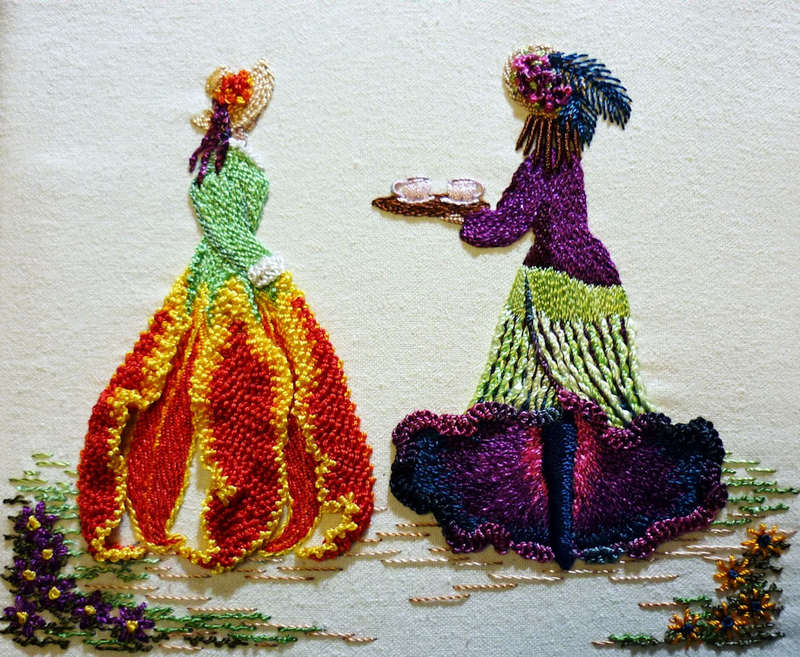 Stitches used: stem, outline, Hopper, bullion, knotted lazy daisy, blanket, satin, couching, Turkey work. This design is available on white fabric. Special Needs: 3 small shsha mirrors; beading thread and needle, 32 #18 darner needles, drizzle paid, old CD you no longer want, strong scissors for cutting the CD. This package contains the Brazilian Embroidery design printed on fabric. Full instructions are in the book "Thorns and Roses." This is available on white or cream fabric. 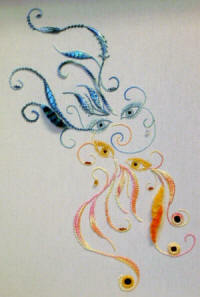 This is an advanced/intermediate Brazilian Embroidery design. 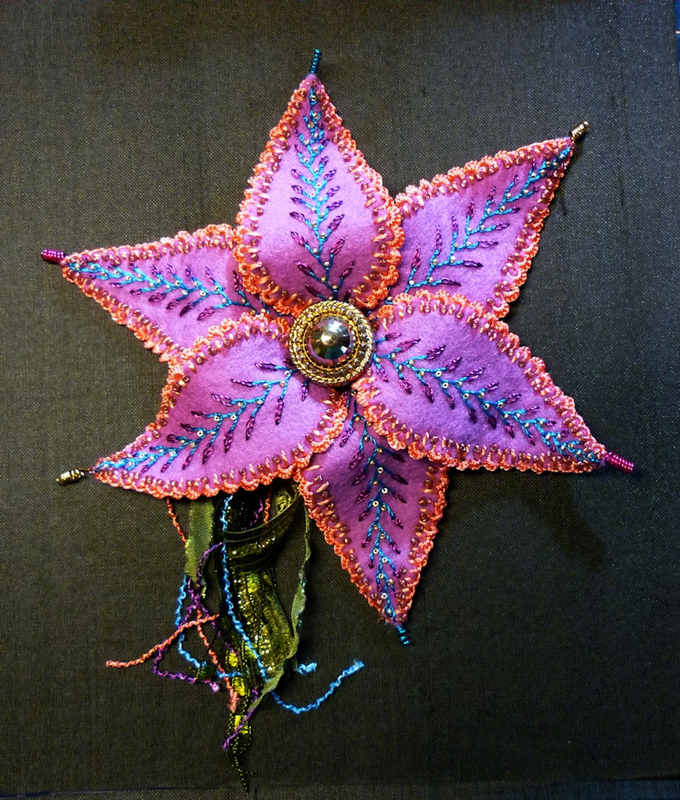 Stitches Used: Bullion, cast-on, lazy daisy, satin, stem, up/down cast-on, stacked stem, pistil. This is available on white fabric. Nova 137, 158, 201, 212. A bright and happy lily made with 100% wool felt and Brazilian embroidery thread and stitches.